If you’ve ever heard a West Point Band member (or anyone else affiliated with West Point) mention a “parade” on the plain or a “review,” these terms are synonymous with the “pass in review.” The pass in review is a long standing military tradition dating back to when Baron Von Steuben arrived at Valley Forge and reported to Washington during the American Revolution in 1778. Von Steuben’s training technique was to create a “model company” and one of the ways he did this was through drill and ceremony, which is still being used to this day. It is of interesting note that when he arrived, he spoke very little English (he is of German decent) and he would often order his translator to swear at his men for him in English. Upon his arrival to Valley Forge, the men were anything but a model company; that is to say until Von Steuben was through with them. 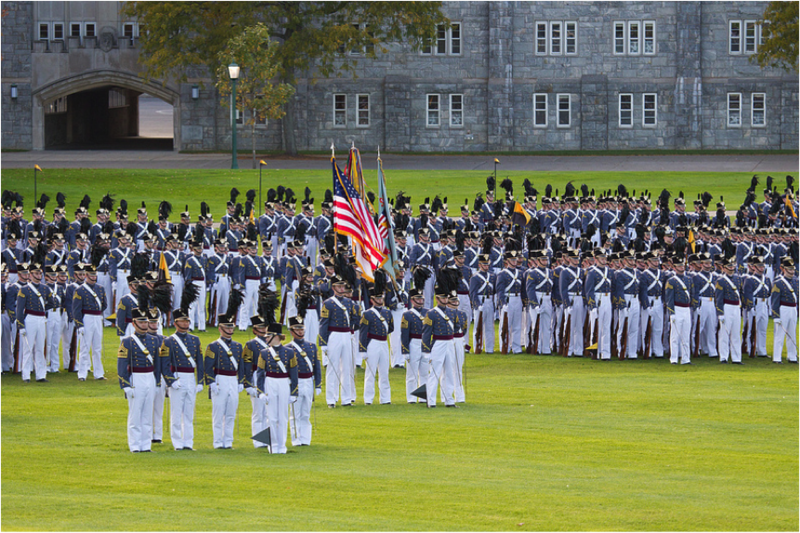 He developed what is known as Regulations for the Orders and Discipline of the Troops of the United States of America, also known as the “Blue Book.” The West Point Band and Hellcats are an integral and essential part of this long standing military tradition. 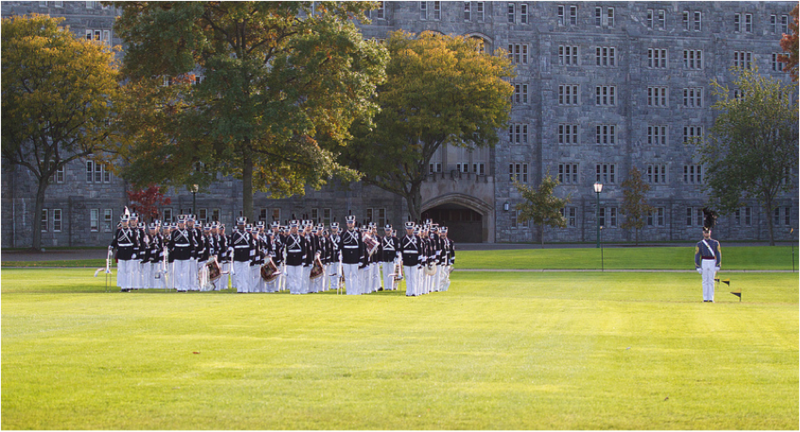 Here at West Point, the pass in review happens before each home football game as well as various other times throughout the year such as graduation week and for alumni exercises and the annual Thayer Awards Review. 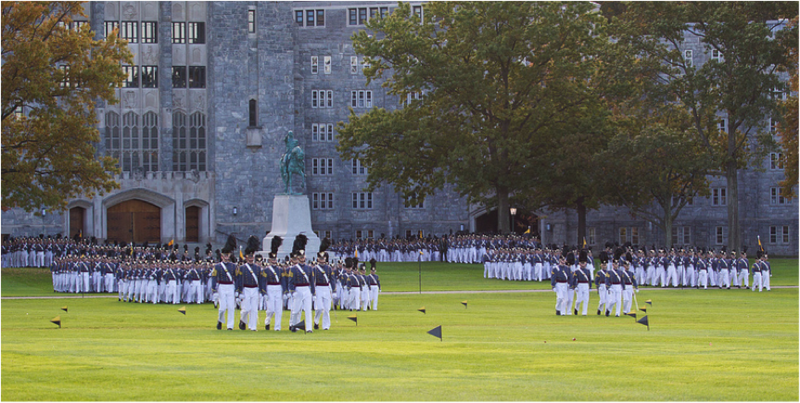 The pass in review consists of several companies of cadets marching past a reviewing party for inspection purposes. On the command of “eyes right,” the cadets turn their head and eyes towards the ranking officer as they pass the reviewing party. This officer is usually the Superintendent of West Point. Upon arrival to the Plain, we make our way down diagonal walk (photograph below), marching to the ceremonious sounds of the Hellcats and a simultaneous narrative about the history of what will be observed in the review. The band marches towards the plain. After arriving at our position on the Plain, the Hellcats join our formation, which is usually a six-person front. It is from here that the Hellcat buglers sound Attention, which alerts the cadets in the sally ports of Washington Hall that the march-on is about to begin. The march-on consists of one to two marches (depending on the size of the participating cadet brigade) which send the cadets pouring out of the sally ports in company formations as they move to their positions on the field. All formed up and ready to go. Once the corps of cadets have gone through a series of “order arms” to “present arms” and back to “order arms” to pay military curtesy to both the Cadet Captain and his/her staff and the reviewing party (usually consisitng of the USMA Superintendent and other West Point leaders), it is now time for the West Point Band to perform honors. This consists of the Generals March right into the United States National Anthem. At the conclusion of honors, the Superintendant utters the words “pass in review” to signal the start of the review portion. Cadets on the plain during a review. After a quick reposition by the West Point Band and Hellcats, the command of “right turrrrrrn” is heard from the corps of cadets followed by the West Point Band drum major’s command of “forwarrrrrrd,” which is then followed by “maaaaaarch” from within the corps. This signals the downbeat and stepoff for the band, as they lead the corps in groups of companies past the reviewing stand. Once past the reviewing party, the band does a series of three left turns to position themselves facing the reviewing party. They remain there at the position of “attention” as they play the remainder of the companies past the reviewing party to the command of “eyes right.” Once past the reviewing party, each company is dismissed and continues marching back to the sally ports of Washington Hall, from where they came. A parade review in action. After the last company has marched past, there is an announcement for the playing of the Army Song, The Army Goes Rolling Along, as the crowd stands and sings along. 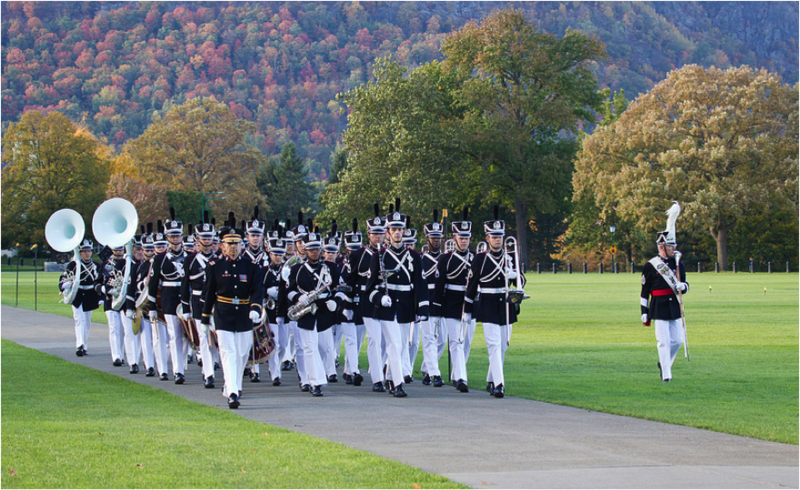 Upon completion of the Army Song, the West Point Band steps off and is also dismissed, exiting the plain and marching past the Superintendent’s house. The Hellcats remain behind to march off the residual companies who are still exiting the parade field toward Washington Hall. This signals the end of the review. If you have never seen one, I suggest you go to at least one. It is a cool sight to see, and it’s one of the many important types of performances that we do here in the West Point Band. The Parades are Amazing. The formations are precise – Gorgeous to watch even when Canadian geese are involved .